elcome to Stony Creek in the Adirondack Mountains! 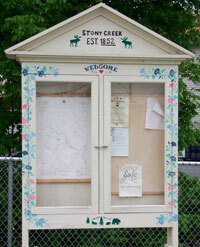 Stony Creek, the "Biggest Little Town In New York State" is located in the southeast section of the Adirondack State Park. With 6½ million acres, this is the largest state park in the country. Stony Creek is about 30 miles from the cities of Glens Falls and Saratoga Springs and less than 25 miles from Lake George and Gore Mt. Ski Area. That's a lot of recreation and shopping in your backyard. For the outdoor loving person, Stony Creek has many lakes, rivers, streams, mountain trails and quiet secondary roads providing an abundance of recreational activities.